I used to buy Easter egg kits to dye eggs with my kids because that's what I've always done. 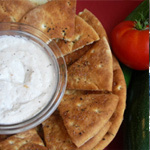 Not wanting to go to the store one day I looked up how to make my own. After trying it out I realized that making it myself was just as easy as using the pellets and you can create the exact color you want. Boil the water. 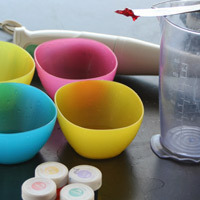 While it's heating up, set out four small bowls, food coloring and the vinegar. 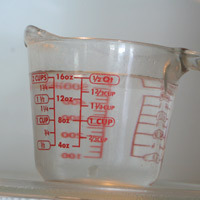 Measure 3/4 c boiling water into each bowl. 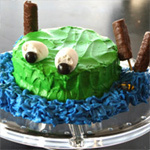 Add food coloring to desired color. Add 1 1/2 t vinegar. Mix well and move on to the next color. 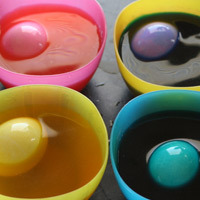 For the most even color, use small bowls so the eggs can be fully or nearly fully immersed. 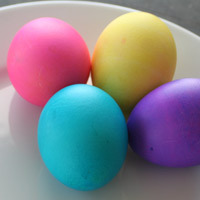 A large bowl will only cover the egg partially with dye. Gently place an egg in each bowl and turn to coat the entire thing. Continue to turn the egg occassionally to coat it evenly. Remove when it reaches the desired color. Place on a cooling rack to dry. 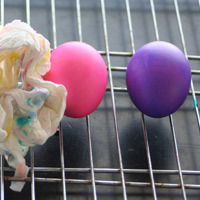 After a few minutes, blot any excess dye drops off the egg so the color will be even. 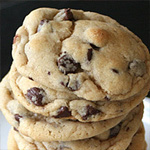 When dry, refrigerate until ready to use. Hard boiled eggs in their shells stay good for two hours at room temperature or one week in the refrigerator. If you peel and refrigerate them, they are only good for 2-3 days. If using food coloring gels instead of drops it is easiest to use an immersion blender to mix it thouroughly. 1. Boil the water. While it's heating up, set out four (1)small bowls, food coloring and the vinegar. Measure 3/4 c boiling water into each bowl. Add food coloring to desired color. 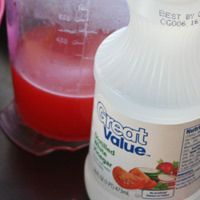 If you are using gels instead of drops, it is easiest to use an immersion blender to blend it well. Add 1 1/2 t vinegar. Mix well and move on to the next color. 2. Gently place an egg in each bowl and turn to coat the entire thing. Continue to turn the egg occassionally to coat it evenly. Remove when it reaches the desired color. 3. Place on a cooling rack to dry. 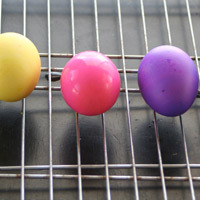 After a few minutes, blot any excess dye drops off the egg or the color won't be even. When dry, refrigerate until ready to use. Hard boiled eggs in their shells stay good for two hours at room temperature or one week in the refrigerator. 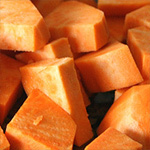 If you peel and refrigerate them, they are only good for 2-3 days. 1. For the most even color, use small bowls so the eggs can be fully or nearly fully immersed. A large bowl will only cover the egg partially with dye.